I have seen many menu plans, but none worked for my family. Most were very ridged and with Don's schedule being ever-changing, and the kids and I with alternative schedules due to homeschooling and electives and such... well, having a ridged menu schedule just never worked for us. We would stick with it for a week, and then get frustrated and give up. No matter how much time, effort, and planning I put into making it, or how good of an idea we thought it was, it just didn't ever work out. I also am a local/seasonal eater as much as possible... It is hard to guess what will be ready for harvest week to week, much less month to month. So a rotating menu was out as well. With all of these adjustments in mind, I set about to figure out how a locavore mama with a completely crazy schedule would be able to take some of the guesswork out of making dinner. And at the start of this year, I put together a plan. It has worked really great so far, so I thought I would share. Please forgive my handwriting and stuff... these pictures are our actual menu for this week and the list that goes along with it. It isn't beautiful like many other plans... but it is easy once you get the hang of it, and it is real. Making a menu takes very little time at this point. One day a week I spend about half an hour going through my pantry, freezer, and fridge and setting up a tentative menu plan. 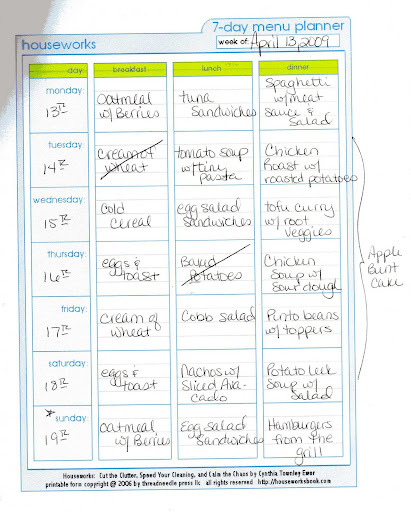 My menu includes all three meals per day and a little room for snacks/dessert column on the side. My goal is to have it written by Monday. My menu is made for a shopping list. Not for a schedule. It could just as easily be put into 7 different boxes with no dates on them, but I found this from Organized Home and I use it because they have made all the boxes for me... and it's cute. When I have my menu made, I set up my shopping list. This means I need to know what is in each meal so I can make sure I have each and every thing I will need. When you add Roasted Root Veggies to the menu, there are the obvious ingredients (potatoes, beets, yams, etc) and then the not so obvious (olive oil, sea salt, etc). I have to make sure I have all the ingredients that we need, and when we don't, I have to add those into the shopping list. I have started to check these basic ingredients when I check the pantry and freezer and that has made it less time consuming. 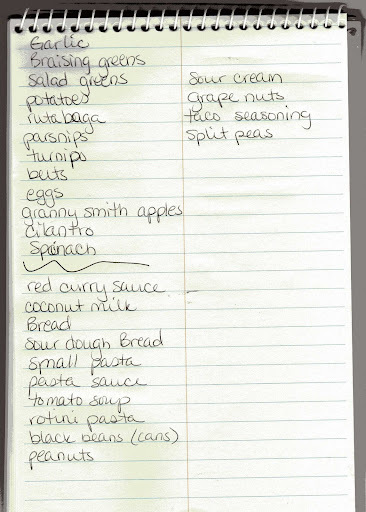 After all that, I can make an accurate list of what we need for the weeks meals. Then comes the shopping. I go first to the local farm store in our area (first part of the list, top left). Terry's Berries. What a slice of heaven it is! This is where I get eggs and most of our produce. Finding a local farm store can be difficult... I found myself very lucky to have known people in this area that told me about Terry's. Finding a farmers market though, is usually easy. Local Harvest is a listing of the farmers markets in the US and an amazing resource for budding locavores. If I had not found Terry's, I would have gotten directions to the closest farmers market from there. Many of them run year round, and the ones that don't, usually start up in April, so right now is the perfect time to start looking for your own farmers market. After the farm store is Trader Joe's (bottom left). Many of Trader Joe's products travel great distances before they reach their stores. If I can get it from the farm that grows everything locally, I will... if not, Trader Joe's has pretty high standards and I accept that the people in their chain of food growers and producers have a decent wage and decent working conditions. Trader Joe's is also the place where I get my convenience foods. For us, that means (all organic) one ingredient pasta, pasta sauce, boxed tomato soup, canned beans, and ready made breads. Those things that help you pull together a decent meal in 15 minutes on a busy night. I stock up on those when I get low in the pantry. My third stop is Fred Meyers (right side of list). I shop almost exclusively in their bulk and natural foods section. They carry Organic Valley brands and also Tillamook products. These are two companies that are large scale and mainstream... but are also local, and have no hormones in their dairy products. Fred Meyers is where I buy my cheese, milk, and also dry bulk goods. I have gallon jars I fill with the dry bulk goods when ever they get low. Because they are in the pantry, I can tell which ones are low at a glance... and it is easy to add them to the shopping list. One thing about our menu implementing is how our menu is used. Notice that two things are already crossed off the list? Those are the things we ate today before I decided to write this. Once the menu is made and up on the fridge, who ever is cooking can pick whatever is on the menu for that meal and make it... then they cross it off the list. If we have tomato soup set on the menu for Thursday and the kids want it on Monday, we cross it off the list and make it on Monday. Because I always know the ingredients for the meal are available, I don't have to worry about making the meal on a specific day. It doesn't always work that way... there are perishables that have to be taken into account and so of course, when you have potatoes that are starting to get eyes, or celery that is going limp, you will want to use that. And others take planning... like pinto beans have to soak and you cook them all day in a crock pot... so you do have to plan a little bit. But with a plan like this, it gives you a lot more control of the days when you spend an hour in the kitchen, and the days you come home to a hot meal in the crock pot.